ROSE AND HELENA SAVE CHRISTMAS is here! Jana Deleon and I share a lot of readers. We’ve both planted things about each other in our books, and readers have loved it. So we thought it would be fun to collaborate on a novella together. The result is ROSE AND HELENA SAVE CHRISTMAS! If you’ve read THIRTY-THREE AND A HALF SHENANIGANS, you know that Mason gave Rose an early Christmas gift–a trip to New Orleans with her best friend Neely Kate. 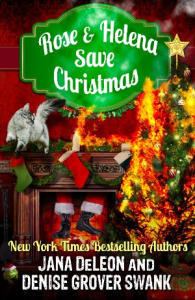 ROSE AND HELENA SAVE CHRISTMAS is their adventure while in NOLA. (Because we all know that Rose and Neely Kate can’t stay out of trouble.) The fun part it they visit Jana’s Ghost-in-Law series. If you’ve read that series, you know that Helena–a ghost–can get in a whole lot of trouble on her own. The best part is Neely Kate finally gets her wish, and she gets a supernatural gift: she can see Helena. Only seeing Helena isn’t necessarily a good thing… it usually means bad things are about to happen. Do I have to have read both series to read this novella? Denise, why do you keep writing these novellas between the Rose Gardner books? It’s not fair to make us have to read them to read the novels. First, when I write a Rose Gardner novel I always do it based on the presumption that readers have NOT read the novellas. To me, the novellas are extra. And if you’re a newsletter subscriber, you know that most of my novellas are actually released FREE on my website before the next novel is released. Sure, I make it available for purchase AFTER I post it on my website, but before, it’s my gift to my readers. Second, I don’t expect all of my Rose readers to read the novellas because some people just don’t like to read shorter pieces. If anything important happens in a novella, I’m sure to include it in the next novel. Third, with my between the novels books, I like try new things I can’t in a novel. Like writing other character’s POVs. We’re firmly in Rose’s head in the novels. It’s fun and enlightening to get other characters take on things. (Yes! For me too!) And with ROSE AND HELENA SAVE CHRISTMAS, it was fun to visit another character’s world. ROSE AND HELENA SAVE CHRISTMAS was actually an experiment. Neither one of us had collaborated on a project like this but it went more smoothly than either of us had dreamed. I had so much fun writing it with Jana and I hope you all like it too! I absolutely love everything you write! Those novellas help those of us that just can’t wait for that next book. ;) I have read the Ghost-in-law series, and Helena with Rose and Neely Kate ought to be awesome! I’ve bought my copy, posted that the book has been released on my FB page, and if I would get off of here and finish the book I’m reading, I could read Rose & Helena’s story! Happy Release day!! !